Congratulations to the Stafford NAACP King and Queen Winners! The Stafford NAACP King & Queen Scholarship Contest was established in an effort to involve the entire community in one of the most important goals of the organization, which is to provide education opportunities through scholarship to students in the area and to help the branch operating expenses so that better service can be provided to the community (e.g., back-to-school and stay-in-school programs). The King & Queen Scholarship Contest consists of programs and activities that support the mission of the NAACP. Each component is strategically planned to integrate relevant challenges, issues, and concerns with practical solutions, techniques, and life skills to enhance development. The winners of the King & Queen Scholarship Contest are determined by a fundraising competition between the participants. The participant who raises the most funds will be placed as the Stafford NAACP King or Queen. The first place winner will then represent the Stafford NAACP Branch and compete at the Virginia State Conference, which is held annually in October. However, all participants will be awarded scholarship funds predetermined by the percentages set by the King & Queen Scholarship Program Committee. See the table below to understand what each participant and winner will receive. 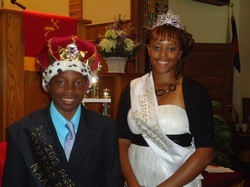 To be eligible for participation in the 2013 King and Queen Scholarship Contest program, all participants must have the ability to represent the NAACP at community or other sponsored events by speaking on behalf of the branch. Further, participants should have plans to further your academic studies (i.e. bachelor’s, master’s, or Phd).